Girl Scouts is proud to be celebrating 101 years of building girls of courage, confidence and character, who make the world a better place. As a national movement of more than 2.3 million girls, 890,000 adults and more than 59 million alumnae, Girl Scouts is a force for developing leadership skills in girls. Since its founding by Juliette Gordon Low, Girl Scouts has been an inclusive sisterhood of women and girls that represents every zip code across the country. In the last 101 years, the world has changed dramatically. When Juliette founded the organization in 1912, women had very few personal rights. Today, girls face another set of challenges as they navigate their lives in an increasingly complex and uncertain world. The 21st century requires a different kind of leader – one who not only values the power of diversity, inclusion, and collaboration, but also is committed to bringing people together to improve neighborhoods, communities, and the world. Nearly 80% of female business owners were Girl Scouts. A full 68% of women serving in Congress were Girl Scouts and every female Secretary of State was a Girl Scout. Nearly every woman who has ever flown in space was a Girl Scout. Girl Scouts of Northeast Texas (GSNETX) was formed as a result of realignment in 2007. In 2014, their council served nearly 31,000 girls in a 32-county area from DFW Airport, east to Louisiana and north to Oklahoma. In Dallas alone, more than 3,000 girls – 67% of which were Hispanic – participated in the Dallas Area Community Outreach Programs (Title 1 schools, low-income areas primarily in South Dallas, in DISD schools). Camp Whispering Cedars, established in 1926, has welcomed nearly 100,000 Girl Scouts since inception. Encompassing approximately 60 acres, Camp Whispering Cedars is the largest urban camp serving girls in North Texas. The camp is located just 20 minutes south of downtown Dallas within the City of Dallas boundaries. Its access to a major urban population, with an estimated 40,000 girls living in low socio-economic conditions, makes this property ideally suited to reduce barriers to participation for a large number of girls and adults who have limited resources and transportation options. The Science, Technology, Engineering & Math (STEM) Center at Camp Whispering Cedars is a pilot program for Girl Scouts USA and is expected to be the model for other urban camps nationally. Camp Whispering Cedars’ proximity to the metropolitan area of Dallas along with its rural seclusion from the urban or suburban environments makes it a unique camp that can offer a careful integration of pristine and protected natural environments and modern technology and its applications. This integration provides endless opportunities to elevate girl programming and experiences to new levels of creativity and innovation. Hunt Oil will identify unique geological features of the site and key areas to observe unique formations on the property, including the escarpment between the Eagle Ford Shale and the Austin Chalk, which runs directly through the site. Texas Instruments will help incorporate STEM learning concepts into a Girl Scout badge-earning workshop, identifying key areas of STEM career exploration to address with the Scouts. Texas Master Naturalists will identify environmental and conservation learning opportunities and help GSNETX to develop focused programming for the Scouts. Fluor Corporation, AT&T and University of Texas at Dallas will all help develop specific STEM-based programming for both the regular summer curriculum and College Journey. City of Dallas/State of Texas will help GSNETX to develop a water conservation and stream monitoring program, in which girls will learn about water and its impact on the environment. Texas Trees Foundation and Dogwood Canyon will identify unique hardwood trees, flora and fauna and other unique natural features on the site, and will help develop hiking and nature trails that highlight these features. Perot Museum will provide STEM-related programming at the museum, and will bring girls to Camp Whispering Cedars to explore the concepts in an outdoor environment. Girl Scouts of Northeast Texas initiated a capital campaign last year during the 100th anniversary of the organization to help support the Whispering Cedars Camp transformation. GSNETX received a $1 million gift from the Rees-Jones Foundation. 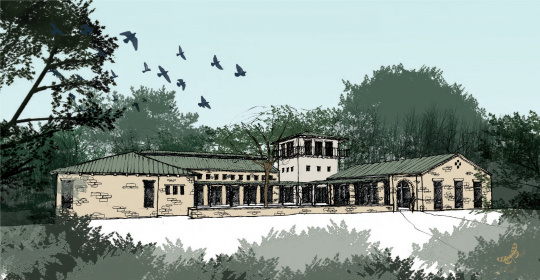 This initial gift allowed Girl Scouts to acquire an additional 36 acres of property immediately adjacent to the camp to provide more program space while creating a buffer from the outside world. GSNETX now has almost 100 acres in the City of Dallas to serve girls and will break ground on the Rees-Jones Welcome Center this summer. In 2016, GSNETX engaged Crescent Growth Capital to facilitate a NMTC financing so as to reduce the fundraising burden required to finance the Camp Whispering Cedars renovation. In December, 2016, CGC and GSNETX closed on a $8M NMTC financing, utilizing allocation provided by Dallas Development Fund and Capital One.